This is slightly disgusting. 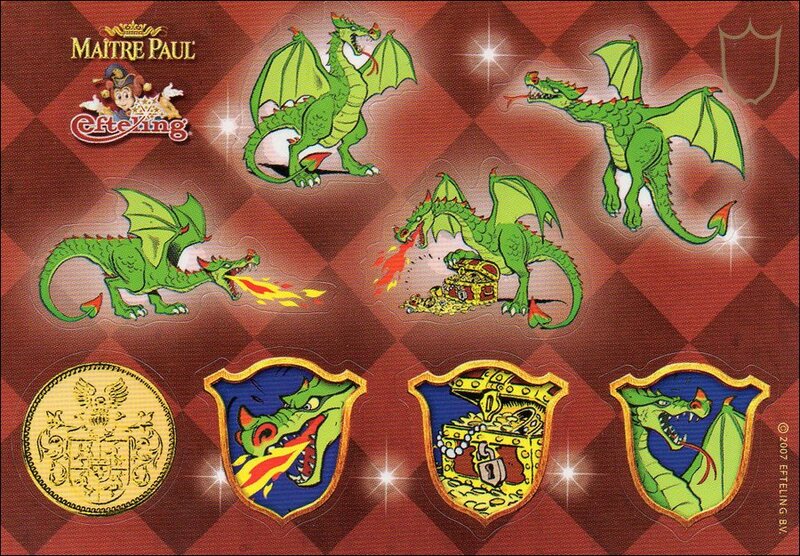 We found an old Efteling item in our possession. What makes it a bit disgusting? It is food-related! 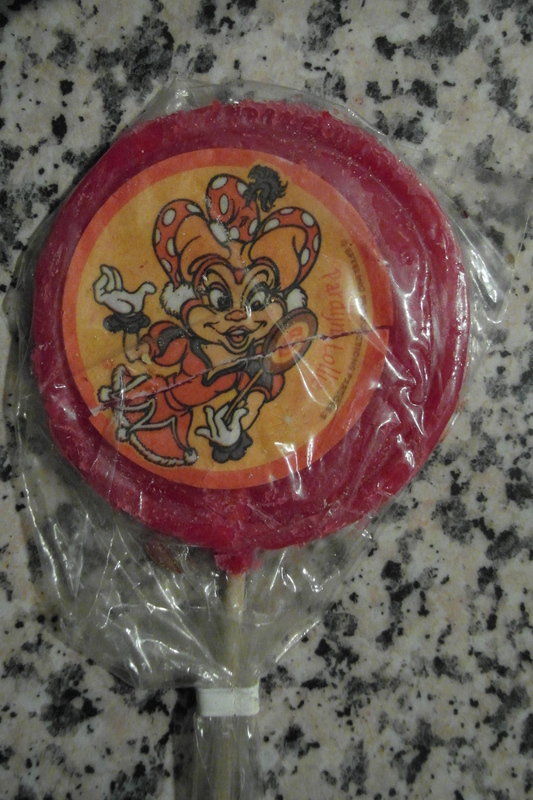 This lollipop has been lurking in our home since around 1997, so about 16 years now! On it is Pardijn, Pardoes’ lady friend. We don’t see so much of her in the park any more, but back in the 90s, Pardoes mania was going strong! We are willing to share! A White Horse, of course! We have recently learned from Eftelist that the White Horse restaurant is getting a renovation. 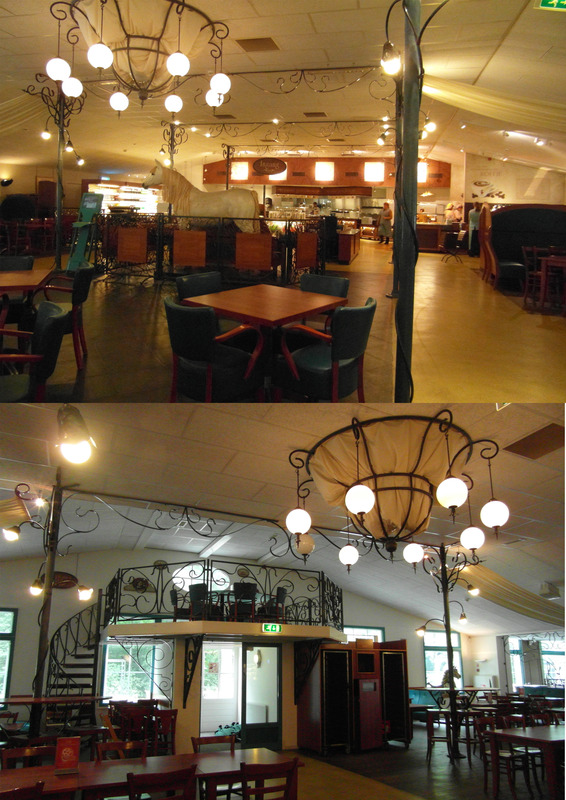 Quite a few years ago it had a clean-up, and it looks a lot better than it did, but it is lacking something Efteling-y when you take a look at other similar restaurants such as the Octopus and Station de Ooste. 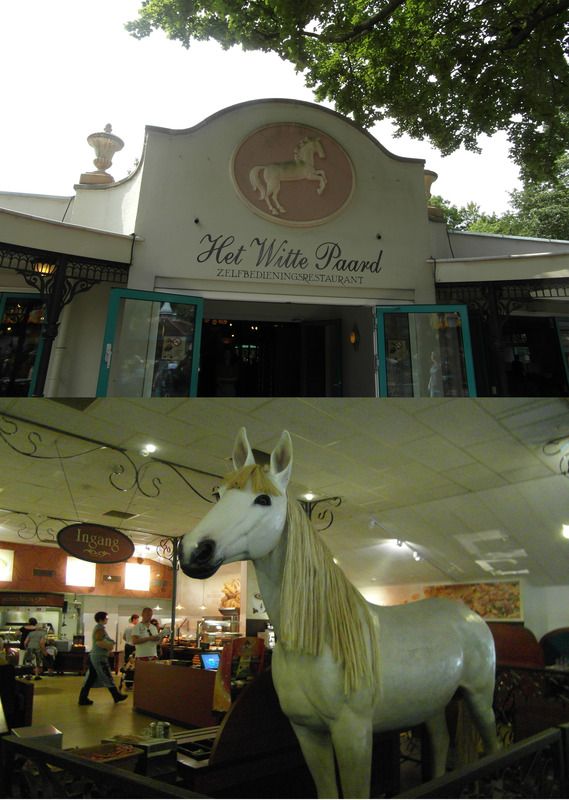 There are two main issues that we have with the White Horse (Het Witte Paard). Firstly, it can get a little draughty; it doesn’t feel cosy, as they always seem to have the doors open on each side of the building. Secondly, the toilets. They are tiny, and every time we have visited, they haven’t smelled too great either! Otherwise it is a nice enough place, lots of food variety and lots of tables. 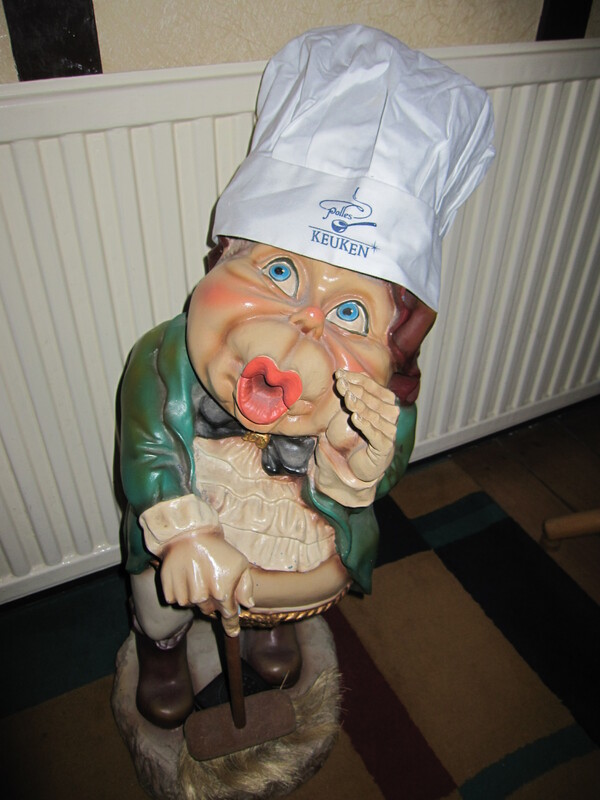 Some better theming would be nice in the restaurant, and we know that Efteling can do theming really well, just look at Polle’s Keuken! At the moment, there are chairs that don’t match, and of course, a White Horse shoved in the middle of the floor. Just in case you forgot that you were in the White Horse, maybe. Hey, those chairs don’t match! The renovation is due to take place in February, and we look forward to seeing what they do with the place! 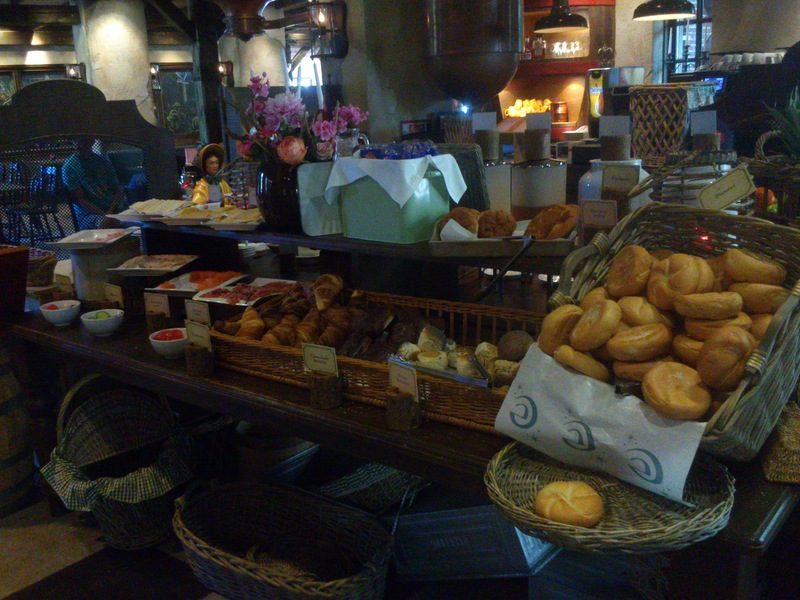 If you have ever stayed at Bosrijk, you will be familiar with the option to have breakfast. You can choose to have it on any morning of your stay, and it costs 15,50€ per adult and 7,75€ for kids between 4 and 12. If you don’t want to pay that much for breakfast every day, the store at Bosrijk’s reception sells bread, cereals, milk etc so that you can make your own. There are seats inside the building as well as outside and in the conservatory. If you get a chance to have breakfast here, it’s definitely worth it! So, we are about 6 days away from heading to Efteling (happy faces!) and we’re trying to book a couple of restaurants. The only option to add on to your booking is the Raveleijn dinner package; aside from adding golf and champagne etc. On the ‘restaurants’ section of the site, you can however book other restaurants, but once you get them to the checkout, they won’t take your credit card. Maybe you must have a Dutch card to book them? Either way, if anyone else is thinking of doing the same from the UK, I advise calling Efteling directly! A couple of years ago, I was wandering around one of those discount supermarket type of places, and out of the corner of my eye, I could swear that I saw the Efteling logo. Was I having withdrawal symptoms? Was all that studying at University driving me crazy? Well, yes to all of the above, but I was right! There it was in the freezer aisle, glistening like a jewel in a frog king’s crown, the Dragon Tart. To the majority of us in this country, it could best be described as an Arctic roll. 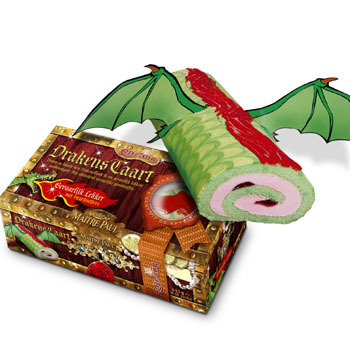 Green sponge cake wrapped around pink ice cream, with a swirl of jam (or dragon blood, if you’d like to think about it like that) in the centre. The thing even had scales printed on the sponge! That wasn’t all. There was a little bag containing those little pieces of candy that crackle when you put them in your mouth, and those were to be sprinkled on top of the cake. Something that was almost as good as the cake, free stickers! So how was it? It was pretty tasty. The fact that it was Efteling-related probably made it more tasty, and the crackling stuff just made it even better! Heck, even the box looked good! The cakes were made by Maître Paul, who make frozen cakes and pastries. If they were still around, we’d tell you all to buy one. Or maybe you could make your own?! 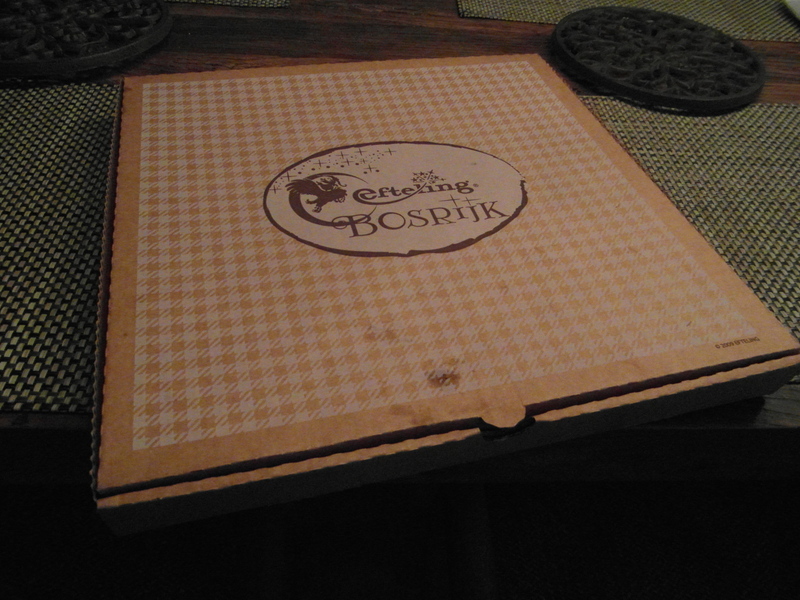 Whilst staying at Bosrijk, the time may come when you feel the need to call for a pizza. Of course, you can go and pick one up from the main building, however if your cottage/apartment is a little further out, you may want to have one delivered. On our last visit, in the name of research, (of course) we ordered a pizza for delivery. The number is located in your accommodation, along with a menu. Once you have ordered your pizza, wait a little while, and a man on a bike will turn up at your door. Your pizza has arrived! 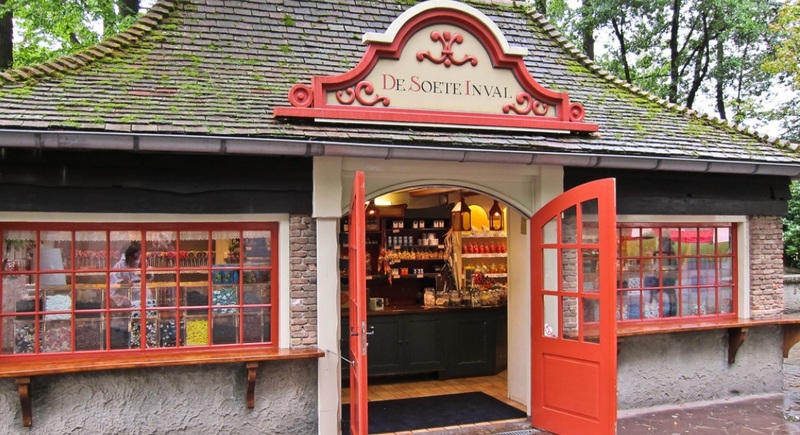 De Soete Inval is located to the right of the Efteling Museum (as if you are looking at it straight on) and opposite a first aid station. They sell 85 types of sweets which you can pick and mix yourself, as well as gift sets including mugs, tins and lunch boxes. It is rather small, but perfectly formed, being decorated in an old-fashioned style. This place can get very busy, and watch out for wasps in the summer! Click here for more sweet photos of the store by our friend Milena. 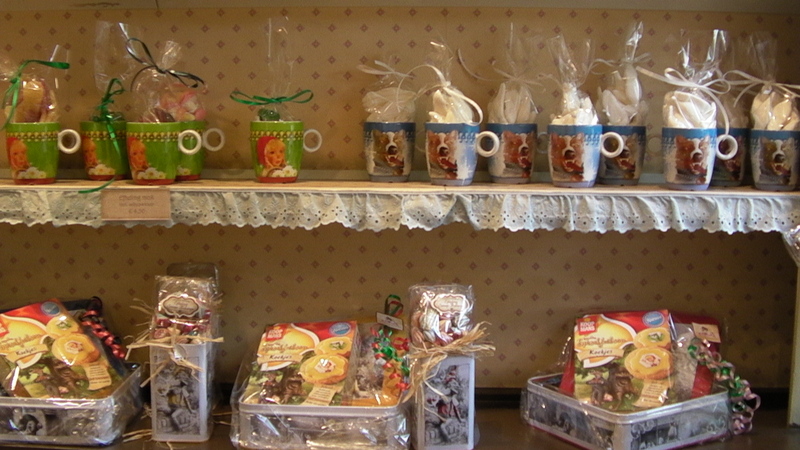 If you are near Efteling, you may want to drop in and pick one of these up! …at least in the U.K it was. We learned last year that the Dutch have a similar celebration at a different time, but of course any day is a great day to make pancakes! We cracked out our Polle’s Keuken pancake mix that we bought back in August last year; it comes complete with a chef’s hat and a wooden spoon! As much as we wish that we could share the lovely taste of the pancakes with you, we can’t, but we suggest that everyone should buy the mix if they get the chance to! 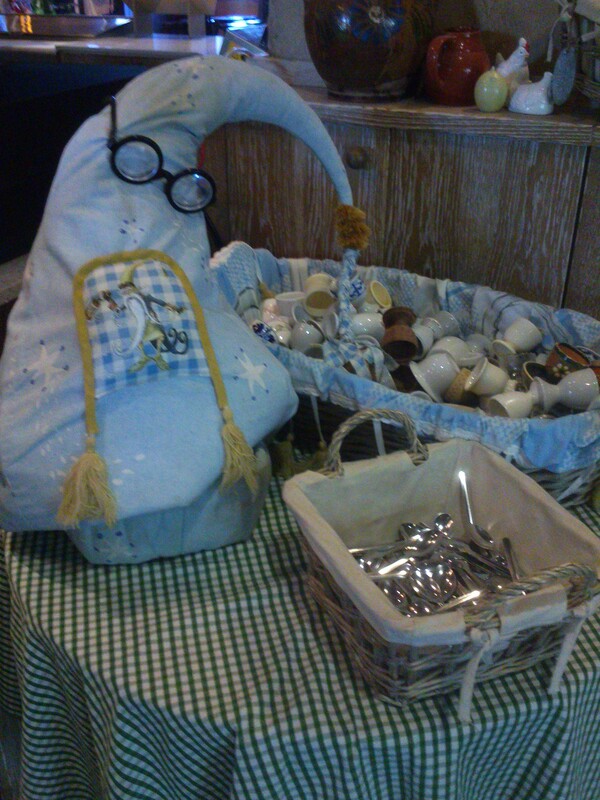 You can buy it at the entrance shop, or at Polle’s Keuken. Laaf Lastpost volunteered to model the chef’s hat, but declined any involvement in the making of the pancakes. 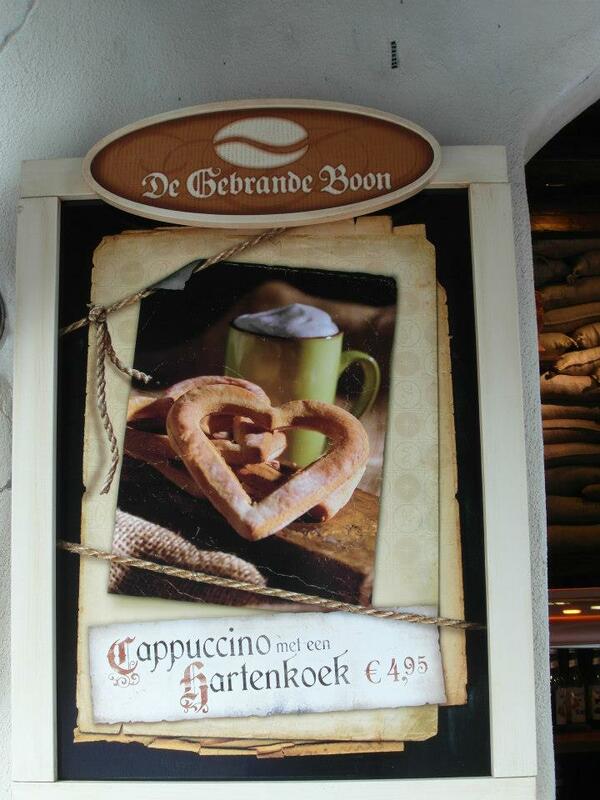 We’ve recently mentioned some of the drinks that you can find in Efteling that will keep you nice and warm in the winter months. And now, onto the food! meatballs with cabbage and red onion sauce, satay and meatballs with pickles and fried onions. If that didn’t make you hungry enough, we’ve shared a photo too! 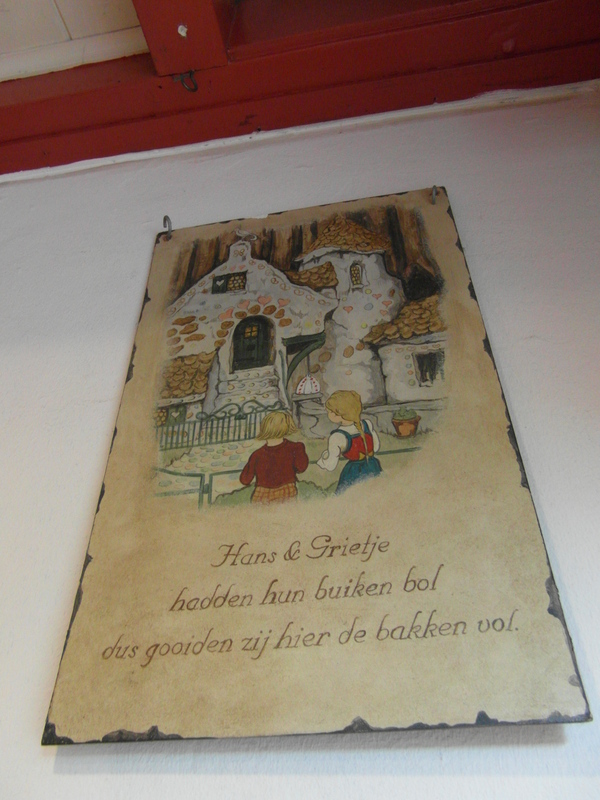 Grootmoeder’s Keuken is located between het Witte Paard and the Carousel. There are a few places to sit nearby, or you could cross the train tracks and eat your sandwich while you take a stroll through the Fairy Tale Forest. 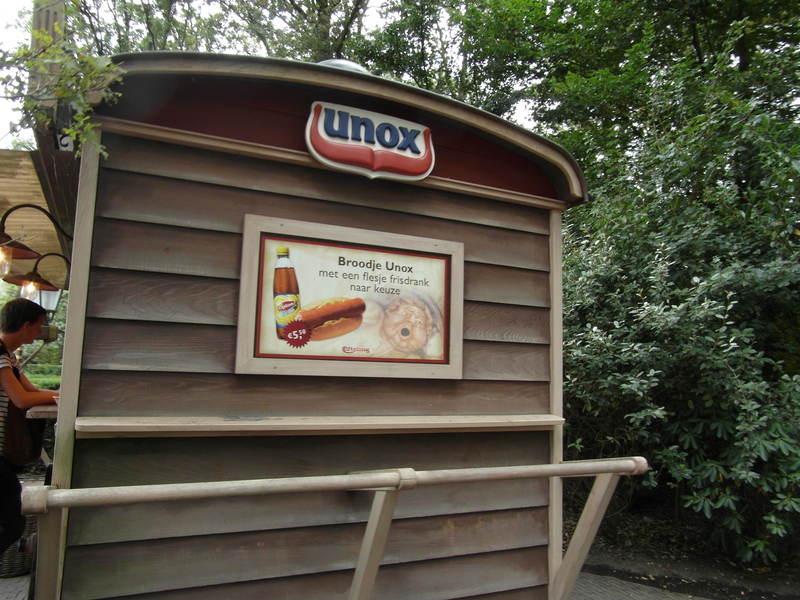 Another good place for hot food is the Unox cart which is located in front of the Flying Dutchman building. Hot sausages in buns make for some very tasty hot dogs! 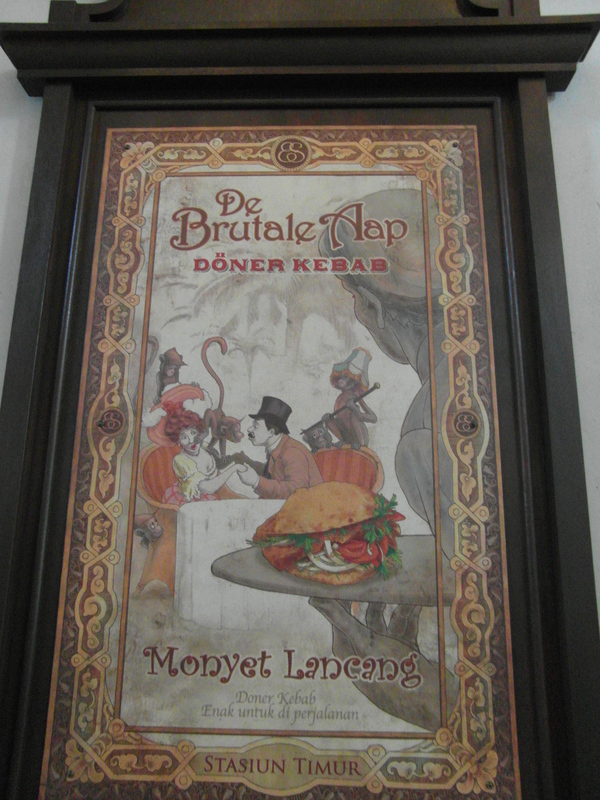 One last one for now, and that is the ‘Cheeky Monkey’ Döner Kebab counter in the East Station building, near the Python. Here they serve Turkish pizza, and of, course, döner kebabs. There is a ton of seating inside and outside of the station too. Plenty choice there for food on chilly days! If you enjoy reading Efteling UK, please share us with your friends, and ‘like’ us on Facebook. You can also tweet us @EftelingUK. Got anything to send us or ask about? Send mail to info@eftelinguk.com!